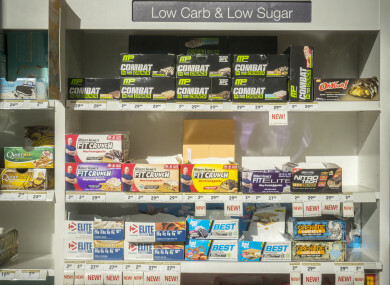 THE WAVE OF protein bars and ‘healthy’ snacks muscling their way into primary retail space shows no sign of abating – and retailers are reaping the extra gains of heeding to the desires of calorie-counting consumers. Earlier this week, retail giant Musgrave announced a €30 million investment in three new SuperValu stores that will showcase what managing director Martin Kelleher calls “shopping concepts” like salad bars and “health and wellness aisles”. Announcing the rollout, Kelleher said the new store layouts will add “both theatre and on trend ranges for the new shopper’s evolving tastes”. But it’s not just the giants that are taking a punt on health kicks. Supermarket chain Fresh – which operates five outlets in Dublin city – underwent a merchandising makeover about three years ago when it shifted away from traditional confectionery and towards healthier snacks. “Brands such as Quest and Nutramino would have come into the market, and we would have implemented them into our impulse sections fairly quickly,” says Shane Byrne, head of marketing and sales at Fresh. The chain still stocks standard bars, but Byrne says they’re positioned in less prominent spaces and the range isn’t as large as it was several years ago. Protein bars and snacks – which often retail at almost twice the price of ordinary sweets – share the same impulse space as crisps and chocolate by the checkout, but they are currently winning a bigger slice of promotional spend. “The standard traditional items would still have quite a high revenue base, but the alternative protein and vegan snacks are growing significantly,” says Byrne. In the last two years, there’s a protein range that’s been the biggest selling skew for our business in impulse confectionery. Previously that area was taken up by the same 10 products year after year. Sugary foods in general account for a smaller proportion of the average punter’s grocery basket than five years ago, according to Douglas Faughnan, consumer insight director at consumer knowledge agency Kantar Worldpanel. “Consumer perceptions and behaviours are changing substantially when it comes to sugar,” he tells Fora, which is what’s driving the wave of protein bars across sweet counters. It’s almost like 10 or 15 years ago, you had a similar movement with regards to the tobacco industry. Now all of a sudden we’re seeing government levies on sugar, on soft drinks. Shane Byrne says Fresh has simply witnessed a change in its consumer base and “when we see that in any department or any category we adapt and try to innovate”. “People are looking more and more into what’s in food, and how they can get the best quality out of a snack that’s impulsive,” he says. For example, the spike in interest in vegan snack foods is also “a big thing” for Fresh. But as consumers re-write their shopping list to reduce the amount of sugar they purchase as part of their overall grocery spend, big brands have begun to reformulate existing recipes and launch ‘healthier’ variants of what is generally considered indulgent or unhealthy categories. For example, Mars, Snickers and Boost bars have been re-imagined as high-protein, low-sugar options. “It’s an obvious attempt from the big food and drink players to try and adapt to meet the changing demand from consumers for healthier products,” Faughnan says, adding that many people who purchase ‘healthier’ offerings still buy junk food. “There are very few people that exclusively buy only the healthier variants,” he says. But the emerging category has still provided an opportunity for smaller outfits to get their product into bigger stores. For example Rathcoole-based Absolute Nutrition – which makes a variety of vegan, refined-sugar free and gluten-free snacks – has managed to flog its wares in several supermarket chains, including SuperValu, Fresh and Avoca. Founder Jo Davey tells Fora that after attending a local gym stocked with bars and muffins, she saw a gap in the market for something without refined sugar but that “people would actually like the taste of as well”. The biggest focus for small players like Absolute Nutrition, Davey says, is standing out from the competition – which is why the brand has chased another key market. “A lot of people bring out new bars and things like this, and they’re trying to compete with everybody else. But it looks the same … it has the same kind of packaging, the same colour. Email “How protein bars and healthy snacks have muscled their way onto sweet counters”. Feedback on “How protein bars and healthy snacks have muscled their way onto sweet counters”.